Yoga is a 6,000 year old scientific system of self improvement that encompasses the whole person. Yoga means union which is applied to the mind and body. Yoga teachings are grounded in the belief that a self fulfilled person is a healthy person. The practice of yoga is designed to lead the person to an ever increasing self knowledge and awareness of needs of body and mind in order to achieve and maintain good physical and mental health. Yoga, in short, is a science of self improvement that deals with the whole human being. A series of postures are taught and practiced that positively influence the body and mind. These postures correspond to energy centers in the body called chakras. Yoga postures can be enjoyed by young and old, healthy and unhealthy, strong and weak. There are levels of experience in yoga. Initially, the concentration is on the physical but there is a corresponding emotional level. Each physical tension has a corresponding emotional tension. Both can be relaxed through the practice of yoga. 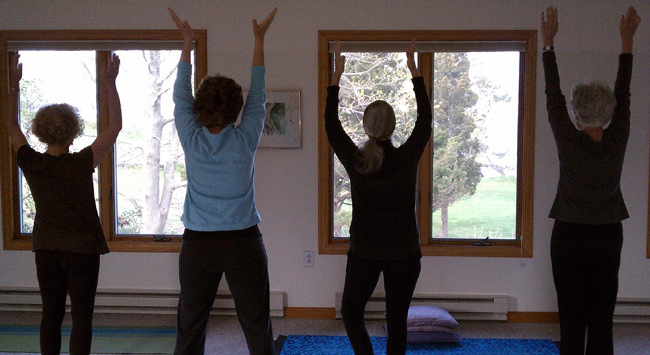 Many aspects of yoga can be brought into a more mindful and relaxed daily life. Metaphors, such as stretching, not straining, relaxing into the tension, awareness and acceptance of feelings, letting go of the usual activities of the mind, always bringing yourself back into balance without judgement, can enhance a less stressful life experience. The many benefits of yoga may include increased focus, breath awareness, flexibility and balance, strength, sense of calmness, pleasure and release of tension in the body, use of breathing techniques for deeper relaxation and sleep, health, improved digestion, and ability to create a more peaceful and mindful existence. Yoga allows for awareness which is the key to change and wellness.